So you’ve been given the honor of acting as the best man or maid of honor at a wedding. Among the many duties you’ll have leading up to the big day and on the wedding day itself, one of your most important tasks is delivering a speech during the reception. If you’re fortunate enough to be a public speaker, this task will be a breeze, but for many the idea of giving a toast is nerve-wracking. Finding the right words, organizing your speech and not boring the other guests and of course expressing the meaning of your relationship to the bride and groom. Here are some tips on how to give a speech that everyone will treasure and love. First things first, start by introducing yourself. While many people will likely know who you are, don’t assume that’s the case for everyone. 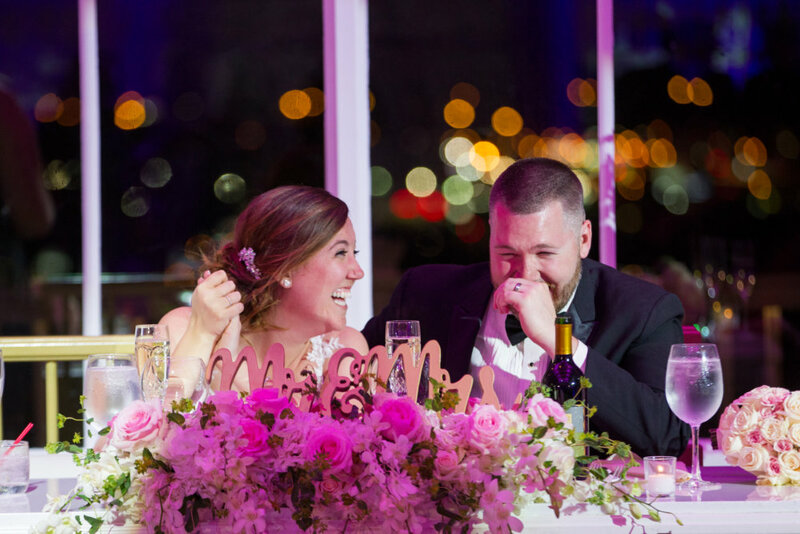 Let the crowd know how you know the bride and groom, what your relationship is – this helps to create a connection to everything you will say after. Don’t try to open with a joke especially if you feel nervous. Jokes tend to fall flat and will make you even nervous than when you began. After you’ve introduced yourself share a short story about the bride if you’re the maid of honor, or groom if you’re the best man. Express what you love most about them, an anecdote about your relationship, something light and fun. From there move on to discuss how the happy couple met. Talk about the first time they told you about their new spouse and how they knew that person was “the one”. Express your own joy for them and seeing their love grow. Though it probably goes without saying – do not mention any of their former relationships or how they “finally got it right”. After this, it’s a good time to switch gears and address the other spouse. Describe meeting them the first time and how appreciative you are of them and how they love your family member or friend. Speak from the heart and welcome them “officially” into the family. Finally, ask everyone to raise a glass with you to toast the happy couple and wish them a long, joyful future together. A final bit of advice for crafting your speech – stay away from inside jokes, no one enjoys listening to stories that they can’t relate to. Too many inside stories or jokes make guests feel excluded and will cause their attention to wane. Instead, save stories or jokes for a more personal moment like the rehearsal dinner or simply write it in their card. Here are some easy to follow tips for ensuring you deliver your speech confidently and with ease. First up, don’t write out your speech word for word. Though it may be tempting to do so, especially if you’re nervous, it will actually make it more difficult to efficiently deliver your speech. This is especially true if you lose your place and have to search a long written out speech on page. Instead, write out phrases and blocks of text that will help trigger your train of thought. This will allow you to speak naturally, but give you an outline to follow if you get nervous or forget what you wanted to say next. It’s also a good idea to keep your speech short and sweet. Aim to speak for 2-3 minutes at most, anything more than that will cause people to lose interest. You should also practice your speech ahead of time with someone else. This will help you weed out any awkward moments or tongue twisters. You’ll also feel more relaxed and confident on the big day. When you’re speaking, speak a bit more slowly than normal so people can understand what you’re saying. People who get nervous tend to speak a bit faster which can cause you to mess up and stammer. Remember to breathe during the speech and not to lock your knees (but don’t slouch!). Try to be as comfortable as possible. You should also keep in mind to make eye contact with the bride and groom, instead of staring at your notecards or paper endlessly. It’s also important to stay sober! Have a drink before if it’ll help relax you, but don’t put yourself in a position where you’re delivering your speech while tipsy, or even worse drunk. Finally, smile! Not only will you appear more relaxed, you’ll feel more relaxed.